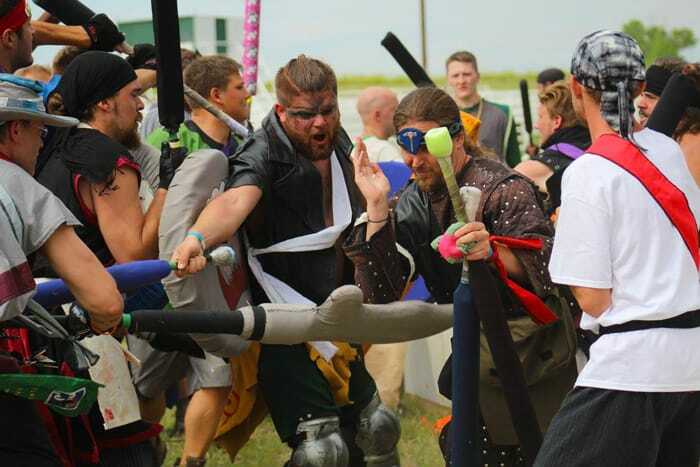 A medieval live combat group steeped in a culture of crafts, role-play, and recognition centered in Colorado. Amtgard is an international organization that provides a framework for safe live combat battles and roleplaying which was formed in 1983. 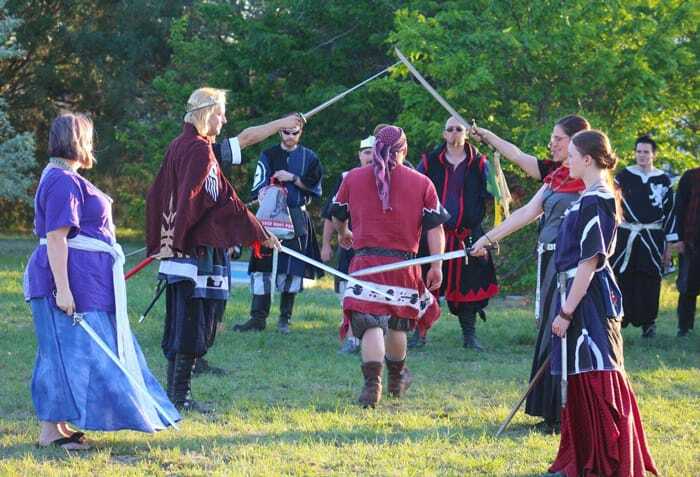 The culture includes a heavy emphasis on crafting with most players making their own garb and equipment and a detailed award structure to recognize accomplishments and contributions in leadership, service, arts, and combat. Members may participate at any Amtgard group and often travel to other areas or gather at large multi-group events. The Empire of the Iron Mountains is an Amtgard kingdom — one of 20 groups responsible for overseeing and maintaining an Amtgard region. 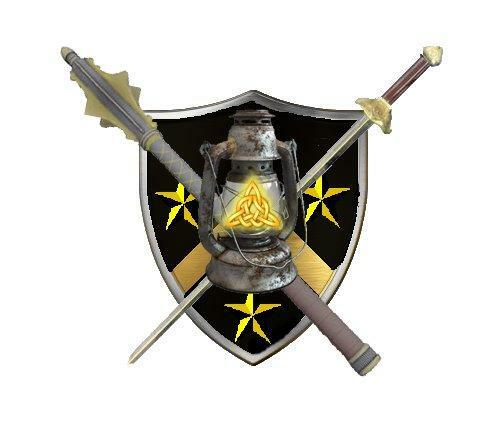 The Iron Mountains was founded in the late 80s and became Amtgard's 5th kingdom in 1992. Currently made up of 6 parks in Colorado and Wyoming, the Iron Mountains has previously included groups across the midwest that have since grown to become their own kingdoms. Amtgard has become more than just a hobby, but really a lifestyle for myself. The people within inspired me to take on leadership roles, expand my creativity through arts and crafts, and really provided a community of like minded people that I now call my family. I've developed some of my closest friends through Amtgard, whether they be local or across the country. 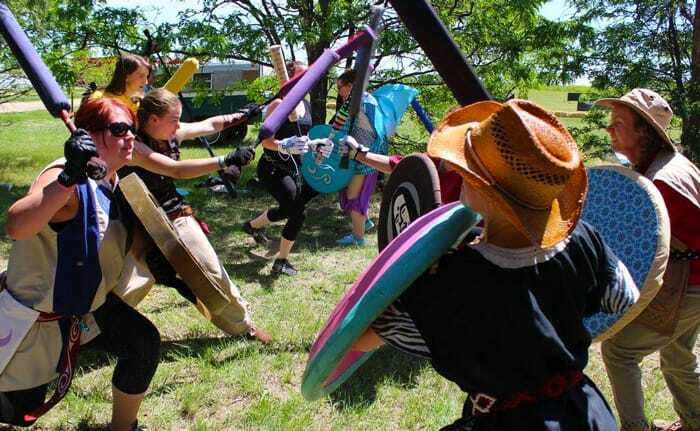 Wear medieval fantasy garb while participating in quests, tournaments, and battlegames with foam replicas of medieval weapons. Our weapons are safe enough that no additional protective gear is required to get involved. At Amtgard's core is a simple hit system where a strike from a weapon to another player's torso, or two of their limbs, defeats them. Amtgard doesn't have any sort of test or chance system. You swing the sword, shoot the bow, throw the fireball, or cast the spell. More involved battlegames use Amtgard's classes and magic where players gain access to projectiles, armor, magic, and abilities. Magic and abilities allow players to freeze monsters with iceballs, protect their allies with enchantments, or command those around them. Battlegames are Amtgard's most common activity and are usually large team-based games with objectives. Capture the flag, rescue the noble, steal the treasure, and more. Each week, players get experience in one of the classes they've played allowing them to level up and unlock new abilities. Quests are more role-play oriented, encouraging players to talk with NPCs, solve puzzles, and defeat monsters. They use Amtgard classes and combat while allowing for more dramatic engagements and often provide rewards for use in future games. Amtgard does not have an ongoing national storyline or predefined world. You get to decide the setting and your persona from historically accurate to heavily entrenched in fantasy. This is a fun hobby, a good way to meet new people, and cheap — which is important to me as a college student! 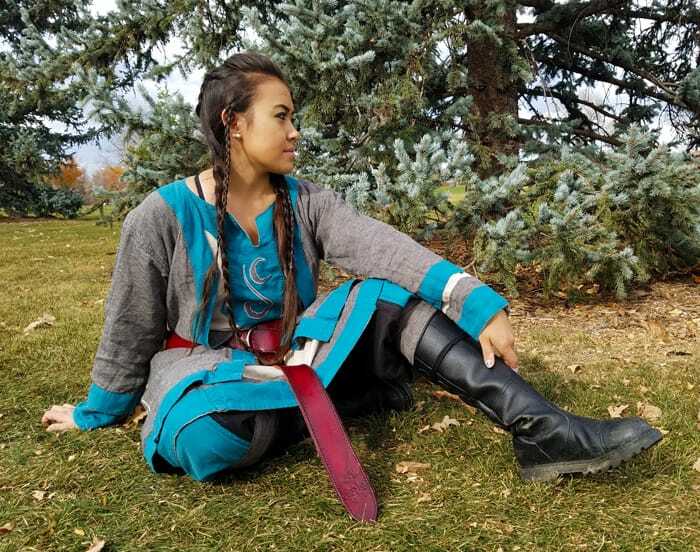 Most Amtgarders build their own weapons, armor, and garb - but our crafting culture doesn't end there. Groups hold regular arts & sciences competitions where players can show off their skills in a variety of different mediums like leather working, painting, singing, and cooking. We support any craft or art that fits in the realm of medieval fantasy. For those looking to learn or teach new skills, groups often meet during the week to work on projects together and share knowledge or tools. Amtgard also has an extensive online community of artisans and many of our larger events include crafting workshops. Amtgard has given me the opportunity to form strong friendships, develop new skills, and expand my drive for leadership that have helped me advance both in mundane life and in the game. I am always happy to recommend the Iron Mountains to any friend or colleague interested in trying out the game. Iron Mountainers are passionate and enthusiastic with a strong drive to be the best we can. We love meeting new members and visitors and we're happy to share our gear, our skills, and our stories. We hold an inter-kingdom event, Rakis, each year in June that draws players from all over Amtgard. Visitors from other games are always welcome. The Iron Mountains has a long history of working with Amtgard on an international level contributing to the rulebook and support structure. We encourage growth and are always on the lookout for our society's next leaders. The member groups of the Iron Mountains each have their own rich cultures that are all worth experiencing. We encourage those that can to travel between groups and we regularly schedule official visits. Thanks to my outings with Amtgard I have met a ton of truly diverse people, and made many friends along the way. This isn't just a game, it is a community of people that grow with each other. The Empire of the Iron Mountains is currently made up of 6 groups based in Colorado and Wyoming. 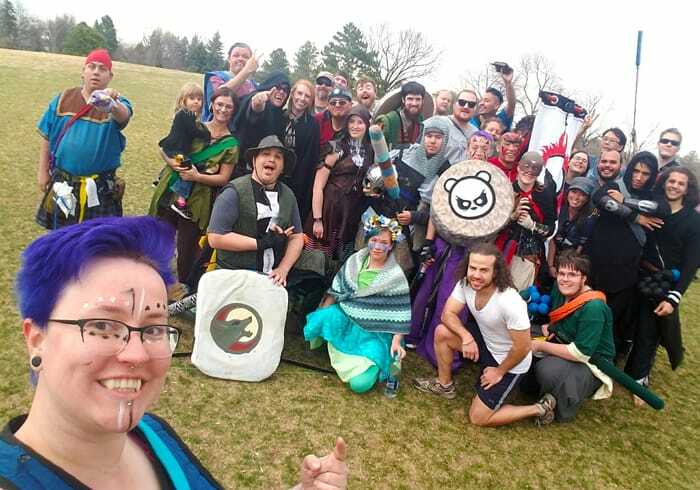 Each group manages its own schedule but usually holds events on Saturdays or Sundays each week with occasional gatherings during the week to craft, fight, or socialize. Find the park closest to you below and visit their Facebook page to see when and where they meet. I've been in the game only about a year, but I know I have found my community and my family in that time. I joined Amtgard because a couple of my friends were playing and I have gained so much more with this group. It is something that has given me new friends, a creative outlet, and an even bigger chance to be the nerd I want to be. I wouldn't have it any other way. Getting started is easy. First, find one of the parks above to attend. We recommend joining their Facebook page to check their current schedule and let them know you're interested in checking out Amtgard. Once you know when and where you're going, you just need to show up. Tell them you're new and they'll show you the ropes. You'll be asked to sign a waiver — minors will need a parent or guardian present — and anyone in your group that is under 14 will need special permission from the group officers to participate. Amtgard is free to play. If you're interested in fighting, we recommend that you wear something comfortable to move around in. Don't worry about having medieval garb on your first day. We always have some loaner equipment available and we encourage anyone interested in fighting to jump right in after a quick lesson. While it isn't necessary, it isn't a bad idea to look over the rulebook for an idea of what's going on. We recommend at least reading the "Made Easy" sections before your first battlegame as they'll describe the general concepts used throughout our rules. We also recommend waiting until you've attended once before making your own equipment. We have specific safety guidelines for our weapons that are easier to follow once you've seen one in person. Once you've been out a few times, you'll want to develop a persona name and persona history. You'll be added to our Online Record Keeper (the ORK) where your experience, credits, and awards will be tracked for any event you attend. These principles support Amtgard’s vision of cooperation, engagement, service and teaching. A collaborative and vibrant community is a foundation for fun, growth, inquiry and learning. Therefore, each member of the Iron Mountains community is encouraged to uphold these principles when engaging with one another and acting on behalf of the Empire and Amtgard. Respect: We honor the inherent dignity of all people within an environment where we are committed to freedom of expression, discourse, and enjoyment by all in our organization. Service: We are encouraged, individually and collectively, to give of our time, talents, and resources to promote the well-being of each other and the development of our local, kingdom, and inter-kingdom communities. Social Justice: We have the right to be treated with fairness and equity and are committed to treat others with the same. Beyond this we have the expectation to challenge prejudice, and the duty to uphold the laws, policies and procedures that promote justice in all respects. Copyright © 2019 Amtgard, Empire of the Iron Mountains. All rights reserved.